ASSUMPTION OF THIS building project evidences both the confident courage and the prudent foresight of the Pastor and the Parish. The need is immediate for a place in which the worship of Almighty god maybe conducted in surroundings appropriate to His majesty and in which the Parish can express its reverence to their Patron, Our Lady of Fatima. The campaign to raise $150,000 has been thoughtfully planned by the Pastor and the Parish Advisory Committee. Account has been taken of the responsibilities already borne by each of the 900 families of the Parish. Provision has been made for giving in small payments over a 24-month period – in monthly sums that can be assured in household budgets and which may entail the sacrifice of a few luxuries. It is not intended that giving to this campaign shall cause hardship to any family. It is hoped that all will give so generously that some small sacrifice will be necessary in every home. 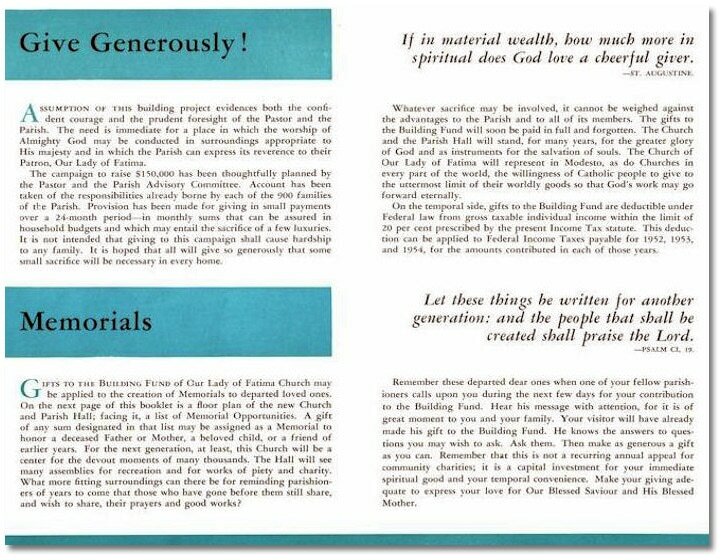 Whatever sacrifice may be involved, it cannot be weighed against the advantages to the Parish and to all of its members. The gifts to the Building Fund will soon be paid in full and forgotten. The Church and the Parish Hall will stand, for many years, for the greater glory of God and as instruments for the salvation of souls. 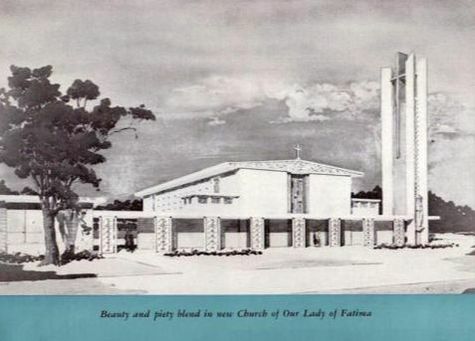 The Church of Our Lady of Fatima will represent in Modesto, as do Churches in every part of the world, the willingness of Catholic people to give to the uttermost limit of their worldly goods so that God’s work may go forward eternally. On the temporal side, gifts to the Building Fund are deductible under Federal law from gross taxable Income Tax statute. This deduction can be applied to Federal Income Taxes payable for 1952, 1953, and 1954, for the amounts contributed in each of those years.